Order your William Henry Limited Edition Cabernet Eyrie Pinot Noir Vine Rollerball Pen today from FahrneysPens.com. Fine Pens, Refills & Luxurious Gifts – great prices & fast shipping. The Limited Edition Cabernet Eyrie Pino Noir Vine Rollerball Pen by William Henry is a tribute to the first American Pinot Noir to successfully compete with the French burgundies in 1979. The barrel is crafted from the vine of the original grape planting with a ruby red topaz set in the clip. 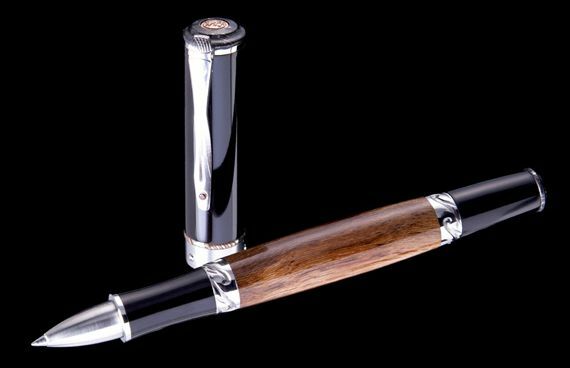 Each pen is crafted with Eyrie Vineyard Pinot vine and ebonite with beautiful etched damascus and mokume accents. The patent-pending cap closure system is made with a ring of chromium steel balls embedded in a titanium ring captured in wave-shaped grooves in titanium collars for closed and post positions. Integrated with a spring loaded system in the cap, the cap locks securely in place with an easy and comfortable release. Each Cabernet Eyrie Pinot Vine rollerball pen is part of a limited edition of 100 pieces, each engraved with an individual serial number inside the cap.